Formal study of Yoga began for Linda as a student of Dr. Bishambhar Sharan, retired professor of Education, Benares Hindu University. He introduced her to asana, pranayama and meditation and shared with her his interest in the Eight Limbs of Yoga, particularly emphasizing yama and niyama: relationship to others and oneself. Guided by these precepts, practical advice for daily life, Linda raised her children as she embraced Moorestown as her home. Linda’s mentor, Dolphi Wertenbaker, M.D., introduced her to Therapeutic Yoga. Through Dr. Wertenbaker, Linda met T.K.V. Desikachar and attended his seminars in New York. She subsequently studied in India at Krishnamacharya Yoga Mandiram (KYM), Desikachar’s clinic in Chennai. Inspired to undertake the study of Yoga Therapy, she completed four years as a student of Krishnamacharya Healing Yoga Foundation (KHYF) and two month-long Internships at KYM. During her internships, Linda saw students with Parkinson’s, frozen shoulder, Downs syndrome, autism, epilepsy, sinus problems, stress, back ache, grief, diabetes, and high blood pressure, as well as those wanting changes in life style and seeking confidence. She observed teachers who, using Yoga as a complementary modality, designed unique practices and treated each person according to their individuality and wholeness. Linda conducted a pilot study on the Effect of Yoga on the Quality of Life for Women with Breast or Ovarian Cancer. 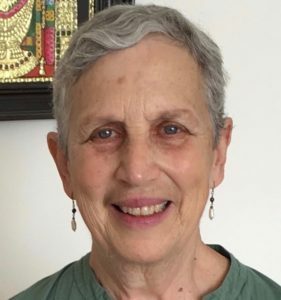 In addition to individual Yoga Therapy and group yoga classes, she teaches Vedic Chanting, Sutra Chanting, and Meditation. She is interested in all physical, mental and spiritual needs and the relationship between them. Linda holds a Bachelor of Science from the College of Charleston, a Masters in Library Science from the University of North Carolina in Chapel Hill and a Bachelor of Arts from Moore College of Art, Philadelphia, PA. She is a practicing two-dimensional artist with a studio at Crane Arts, Philadelphia, PA, and part-time reference librarian at Willingboro Public Library. In 2010, Linda received KHYF Certifications as a Yoga Teacher and Yoga Therapist.